The SHAPE Paparazzi with Bloc is an ergonomic-designed Paparazzi Handle screwed tight to a Rod Bloc by two 1/4" screws. The Handle features a total of 20 screw-holes for attaching accessories, and the Bloc mounts 15mm rods and keeps the Handle parallel with a camera. You can slide the Bloc up and down the rods and tighten it into position by a red lever on the side. Both the Handle and Bloc are totally solid -- not at all hollow -- and are both water cut / laser cut, as opposed to being molded. The 20 screw-holes are a mix of 1/4", 3/8" and 1/2" sizes and all run completely through from end to end. They are positioned vertically or horizontally along the Handle. 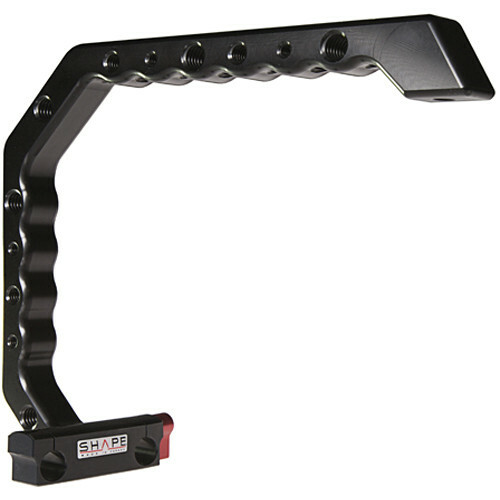 The 1/4" and 3/8" holes can take on most any 1/4" and 3/8" accessories like lights, monitors, mics, grips, remote controls, recorders, articulating arms, wireless audio receivers, camera plates, and more. And into the 1/2" holes you can screw in male-threaded SHAPE rods. The diverse set of screw-holes lets you get very creative in dressing up your rig. And the ability to screw in rods lets you just as creatively extend your rig. Takes on lights, monitors, mics, grips, remotes, recorders, arms, receivers, rods, etc. Box Dimensions (LxWxH) 15.1 x 10.55 x 4.25"
Paparazzi with Bloc is rated 3.8 out of 5 by 4. Rated 1 out of 5 by Dangelmaier from Poor quality control in machining The unit comes in two parts. The tolerances used in machining the unit were not tight enough (presumably), and the unit would not screw together properly. It took me approx. an hour of using attempts and brute force in order to get them together. My son took them apart (without knowing) and it took me 15 minutes the second time to force them together. I ended up not using the part that would not come together, and came up with an alternate solution to get it to work. Yeah, I probably should have sent it back, but it was needed that weekend (I couldn't go without it). I do not recommend this product, if more than just my version of it has issues. Rated 5 out of 5 by Jason from A must have for all dslr video shooters! Loving this new setup for my rig the possibilities seem endless with all of the threaded hole and super convenient rod mount bloc. I will be using this on all my shoots and highly recommend it for anyone who wants a solid feeling rig with an awesome form factor and amazing grip. The notches for your fingers make it really solid and stable in the hand.